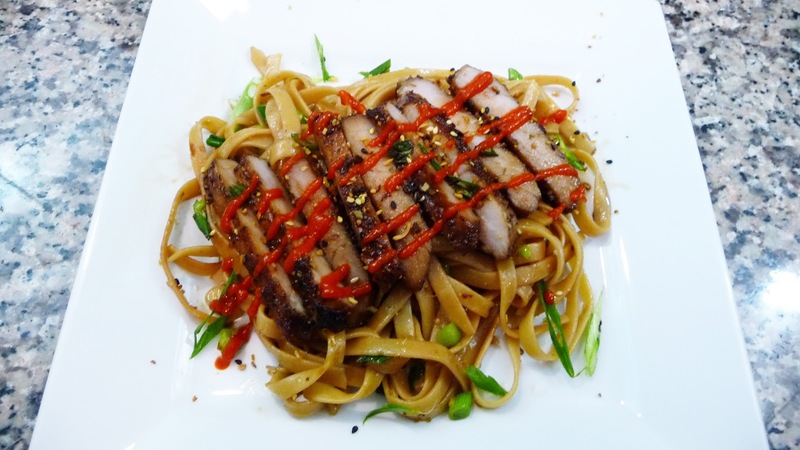 This noodles are so easy to make and full of flavor. They go perfect with the Pork chops you saw on my last video. They make a beautiful combination for dinner any day of the week. I hope you give them a try! Enjoy. Cook the noodles according to the instructions on the package. Drain them and set them aside for a minute. In a large Skillet or Wok, on medium heat, heat up two tablespoons of sesame oil, then saute the garlic for about 30 seconds or until aromatic. Then add in the noodles and season them with the Asian seasoning, crushed red pepper and black pepper to taste, and stir fyr them for two minutes. Then add in the soy sauce, toss and add in the green onion, stir fry for two more minutes or until the noodles are well heated through. Once the noodles are heated through, serve them immediately.